We have been saying our goodbyes to everyone we’ve met over the past 26 months. It’s a long list. There are the 33 other volunteers who entered Peace Corps with us on September 11, 2012. We have been through a lot with them. Nine weeks in Kanye enduring long days of classes topped off with the tensions (and rewards) of staying in homes with host families. Bidding farewell to each other as we scattered to our unseen sites in remote villages around Botswana. Becoming close friends – either by choice or by necessity -- with volunteers living nearby (i.e. an hour or two away by combi or hitchhiking). Working on projects together, going on vacation trips together and coming together at training conferences. Becoming surrogate parents for some of the younger single volunteers, including hosting them for Thanksgivings, Christmases, birthdays, etc. Our cohort (known as Bots 13) did pretty well: over 80% of us made it all the way through, and most of those who did not had medical reasons for leaving. People say we’ll remain lifelong friends. That has certainly been the case for Stephanie’s Kenya Peace Corps compatriots from 40 years ago. Bots 13 field trip to the Gaborone Peace Corps office during training in 2012. We still looked fresh faced. There are the people in Goodhope whom we’ve come to know as friends and neighbors: tribal chiefs and preschoolers, government bureaucrats and hospital workers, police officers and grocers, farmers and widows. We’ve learned the importance of saying hello to everyone and first asking in Setswana how the day is going before getting down to business. During our first weekend in Goodhope two years ago, we attended an outdoor wedding at a neighbor’s house, introducing ourselves to the locals. Yesterday, we attended a funeral at that same house, saying goodbye to many of those same locals, now our friends. We're the Goodhope Donovans. 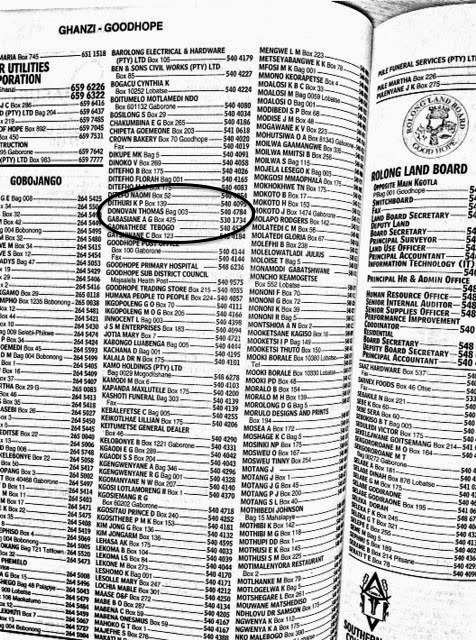 We're even in the phone book. I kind of feel like Steve Martin in The Jerk. Then there are the workers at our schools. The cooks, groundskeepers and guards were my first friends. They were patient in helping me improve my spoken Setswana. They always asked about Stephanie. They delighted in seeing our children come to visit. Our fellow teachers were friends and compatriots. They helped me to become a half decent teacher. We spent afternoons under the hot sun coaching sports together. We laughed at the antics of our students and complained about our work schedules. Our teaching comrades each hosted us for going away parties this past week, lavishing us with presents that will challenge our baggage weight limits. Lots of Botswana themed gifts at the going away party. Finally, and most important, are the students at our schools. We taught them to develop the skills to avoid HIV and live healthy, productive lives. I taught math to two classes. Then of course there was track and softball coaching…. Building on all of those relationships, I was able to convince a number of boys to get circumcised: a tough ask for adolescents, but it reduces the risk of spreading HIV. Many of our students lack one or both parents, either due to abandonment or AIDS. For some, we acted as parental figures, gentler adults who do not use corporal punishment to enforce discipline in school. Saying goodbye to them was the hardest. There were plenty of tears on all sides as we said goodbye on Friday at assemblies at each of our schools. My Form 1 math class. I wish they were as enthusiastic about solving word problems. We leave Goodhope tomorrow, Gaborone the day after, and Africa the following Monday. People want to know when we are coming back, and the best we can say is the verse they recite to us: “re kopanela go kgaogana, re kgaogana go kopanela”, which means “we meet to part, we part to meet”. We’ve been here in Botswana for more than two years. At this point, I’d say that we have met the Peace Corps expectation to become integrated into our community. People wave when either of us walks past. Strangers greet me by my Setswana name, Kabo. The clerk at the post office asks me how her son is doing in my math class. I run into students in church. The proprietor of the general dealer (corner store) tries to stock eggs and 2% milk for us. We think nothing of spending five hours participating in Botswana Independence Day festivities at the Goodhope kgotla (the village meeting place). Stephanie leaving our local general dealer with bags full. If they don't have it, we don't get it. Being integrated also means that I am less likely to take guff than I would have one or two years ago. One of my pet peeves is being called “lekgoa”, or “white person”. We are the only white people in Goodhope, so we certainly stand out. But I try to educate people to call me by name, and not by race. So I say “lekgoa le na le leina” which means “the lekgoa has a name”. That usually starts a conversation and leads to the other person addressing me as Kabo (if an adult) or Mr. Donovan (if a child). Fellow teachers at my school have told me to lighten up a bit, that lekgoa is usually meant as a compliment. But even so, as I see it, dwelling on racial characteristics focuses on just one feature of an individual, a feature that has a troubling past in much of Africa. There are many challenges to living in rural Botswana: the lack of water, sometimes for months on end, the limited food options, and our limited fluency in the local language, Setswana. Still, there is much to recommend living here. It is quite safe: we have not been the victims of any crime in Goodhope. Things are very quiet most of the time. There is little auto traffic, which is good for the cattle, goats and donkeys that share the road. We hear an airplane overhead maybe a couple of times a year. People are polite and students are, for the most part, respectful of teachers. The pace of life and work is much slower. The air is clean and the skies are a brilliant blue most days. The sunrises and sunsets are stunning. It is not surprising then that some Peace Corps Volunteers stay on in their host countries after their tour of duty ends. In Botswana, some PCVs never leave. In fact, a few Volunteers from the 1960s are still here. They started businesses. They married Batswana. They settled down and spread roots here. The longer I stay here, the more I understand why some Americans would find that life attractive. Still, it’s not for us long term. We crave the variety of food in America. We look forward to driving cars again. I miss Western highbrow culture: the music, books and arts. I miss the American work effort with its creative, problem-solving focus. And of course there’s our home, family and friends. To put it simply: we’re Americans. We’ll return to the United States in November. Before we left Manchester, I read some literature on the value of leaving home for an extended period time. It gives a person a better perspective of what else is out there, but more important it gives a better perspective of where one comes from. The return home is the most important part of the journey. Arnold J. Toynbee and Joseph Campbell separately wrote about this as a unifying theory for the lives of heroes in both history and mythology. That’s not to say that I am like Odysseus returning to Ithaca or Napoleon to Paris. But it does mean that this experience has changed me, and hopefully for the better. I understand that the news Americans get from Africa lately hasn’t been good. The Ebola outbreak in West Africa has people frightened. The end stage of the disease is gruesome and often fatal. Its rapid geometric spread puts thousands of people at risk. The attending health care workers who wear head-to-toe protective gear present a television visual like something out of Robin Cook’s The Hot Zone. Let’s get things straight. Africa is a big continent. We are 3000 miles away from the countries of West Africa. Still, for Peace Corps Volunteers in Africa, the news about Ebola has hit closer to home. Volunteers were evacuated from the three affected countries: Liberia, Guinea and Sierra Leone. Two of them were placed in isolation for a time because of some sort of contact with Ebola victims. The infection risk comes from direct contact, and Peace Corps Volunteers are not in the business of providing medical services as such (although there is a new program called Peace Corps Response that supplies American medical workers to a few countries). So why the evacuation? From the information we received, it is because of the Ebola-caused degradation of the health care systems in those three countries, systems that Volunteers may need to access for their own medical needs. That is, it wasn’t the fear of Volunteers getting Ebola that caused the evacuation. I also think that Peace Corps has become hypersensitive to bad publicity. The agency was stung recently by a New York Times piece about a young Volunteer in China who died from an intestinal infection. The article included extensive critical statements from the understandably upset parents. But here’s the thing: Volunteers sign up to live as part of communities in mostly rural villages far away from top flight medical centers. While most Volunteers agree that Peace Corps provides them with excellent medical care when needed, it is not the same as health care in the United States. To the extent Peace Corps feels obligated to supply Volunteers with instant access to all types of top-flight medical care, the unintended consequence will be that Volunteers will be less integrated into rural communities. So here’s hoping that doesn’t happen. Besides, Ebola is far from being the biggest health threat in Africa. While various malaria interventions have lead to plummeting mortality rates in recent years, the disease still kills more than 500,000 people annually on the continent. HIV rates are very high in some countries, including Botswana, where the incidence among adults is around 25%. 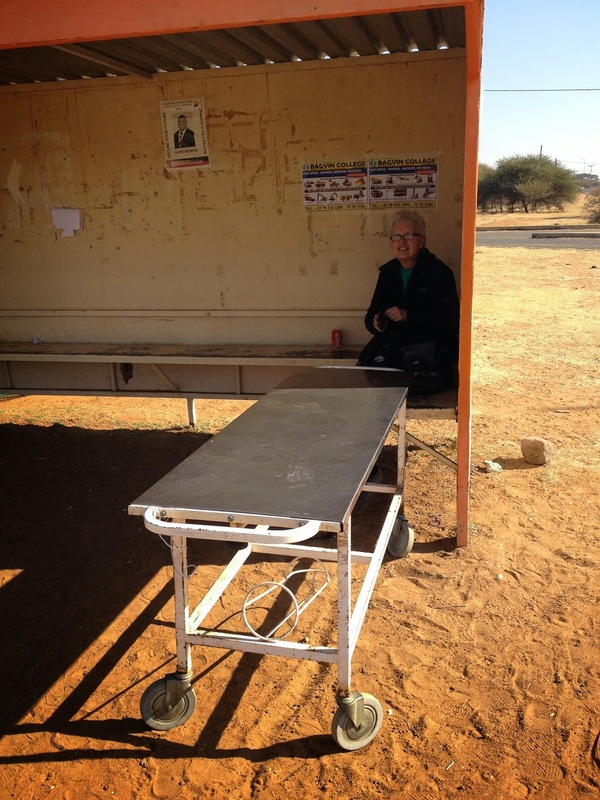 In fact Peace Corps Volunteers work in Botswana to change the behaviors that exacerbate the HIV epidemic. 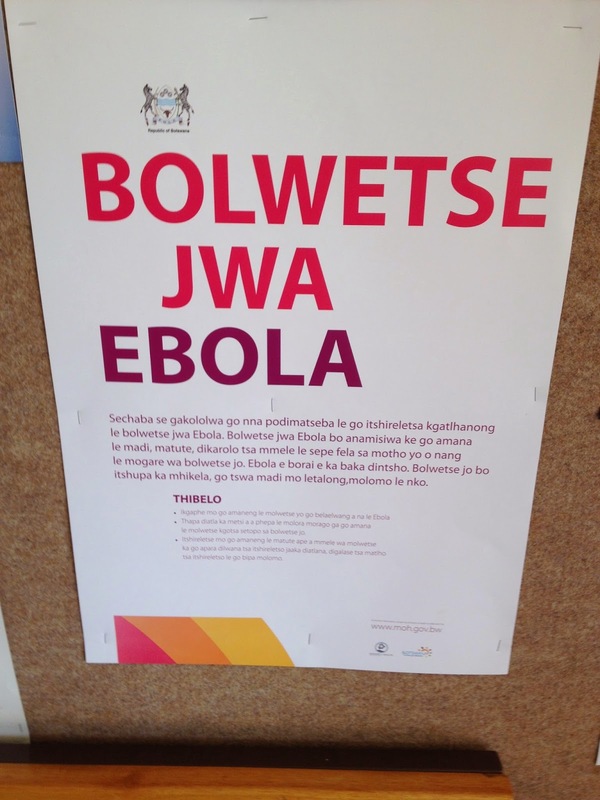 That’s not to say that health authorities in Botswana aren’t paying attention to Ebola. It’s on the news regularly. There are posters on public buildings alerting people to the threat that is still many miles away. Health workers are receiving special training. We are friendly with public health nurses in Goodhope. Lately they have been putting in time at the nearest border post with South Africa (about 40km from here). They tell us that the immigration folks flag anyone whose passport shows travel in one of the affected countries. The nurse then interviews the person to determine whether he or she poses any health threat. This information poster appears in public places all over the country. Enough with the public health discussion. How are the two of us doing? Overall, our health has been excellent. Lots of walking, little access to fast food and a warm, sunny climate do a body good. Still, each of us caught a cold during the winter months (June & July). Once infected, it takes a while to shake it off. The dry climate makes for more coughing and bronchitis, which takes a while to go away. We are fully recovered now. Despite suffering from bronchitis, Stephanie bravely waited at a bus shelter for a combi to take us on our weekly shopping trip. Note the hospital gurney parked nearby, ready to whisk her away in case she were to collapse. On closer inspection, the gurney was missing a wheel, and a rock propped up one corner. Before we return home in November, Peace Corps will put us through a battery of tests for various diseases, including HIV and tuberculosis (which is also a problem here). We will have to produce stool samples on three consecutive days for assorted parasite testing. Stephanie says that the surest way for her to be unable to produce a stool sample is to be told that she needs to produce one. Then we will receive a pill to eliminate the freshwater-endemic schistosomiasis (bilharzia) parasite, which we are to take as a precaution, even if we test negative. One last comment about Ebola. Part of the challenge facing health workers in West Africa has been misinformation about the cause and treatment of the disease. Some of that misinformation is spread by people who should know better. Nearby Nigeria is famous for its television preachers. They boldly claim that they can heal many types of afflictions. On one popular television network, available throughout Africa, a preacher regularly presents testimonials from people who claim to have been cured of AIDS through prayer and the laying of hands. Such misinformation can limit the effectiveness of our HIV prevention work here. With respect to Ebola, the Nigerian government has called on these preachers to cool it. For once, they may be listening. Let’s hope so. 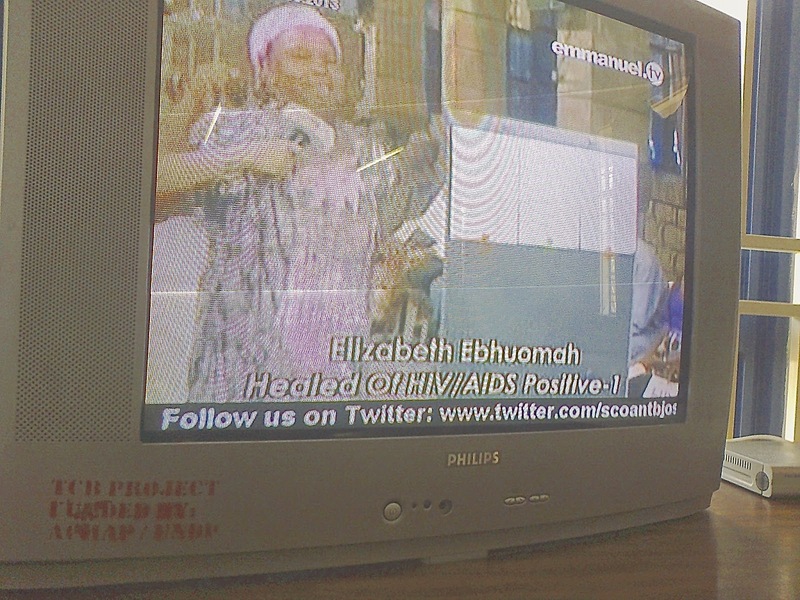 Satellite TV broadcast from Nigeria showing a woman testifying about her medical condition. The caption reads: "Healed of HIV/AIDS Positive". I wrote more than a year ago about Peace Corps’ long association with softball in Botswana. I also described my own effort to continue that heritage by helping to coach boys and girls softball at my school. Here is an update. As you may recall, softball takes place during “ball sports” season, roughly from April into July. June and July are winter, the coldest time of the year here. Practices take place late in the afternoon at the end of a long day: classes run from 7:40 to 1:30, then lunch break lasts from 1:30 to 2:30 followed by study time from 2:30 to 4:00. The students quickly change from their school uniforms into sports attire and hit the adjacent ball fields. They finish practice around 5:30. Then they head home. Some walk 10 km or more, and so arrive after dark. Our girls warming up at an after school practice. Note the girl in pink with the pink trimmed glove sent from Manchester. Organizing games requires much more effort than in the United States. Because buses are difficult to commandeer, minimizing transport to games is a priority. Teams from several schools assemble at one school late on a Friday. Everyone stays over for the whole weekend, playing three or more games in round robin fashion. After a couple of these weekend tournaments, the best boys and girls teams from a cluster of schools meet in a weekend sub-zonal elimination tournament. The best teams from that tournament go on to one of four zonal tournaments. The top two teams from each of the four zones then advance to the national tournament, from which Botswana’s top boys and girls softball teams are crowned. The same gauntlet applies to the other ball sports: football (soccer), volleyball, netball, basketball (in some schools), table tennis and badminton. Our softballers love going to tournaments. They spend the weekend with their friends from all of the other ball sports. They don’t have to perform their typical weekend chores: washing laundry, preparing meals, cleaning house and tending livestock. Instead, they sleep together in classrooms (boys in one, girls in another) at the host school. The classrooms are not heated, and it can get below freezing at night. So several students might share a foam mattress and sleep under shared warm blankets. There is even more to like: they don’t have to wear their school uniform and they bring along music to play. Our boys pick up their classroom bedding before dawn at the beginning of a tournament day. Where do I fit into all of this? I come to the tournaments. Sometimes I (along with other coaches) sleep in the classroom with the boys. I assemble a bed from six desks, and then put a yoga pad and sleeping bag on top. It isn’t the best night’s sleep, since the boys can’t help but chatter long after bedtime. Other nights we coaches find a spare empty classroom and camp out there, in relative quiet. Food is also a big attraction at tournaments. Our school cooks come along for the weekend. They bring food, kettles, a propane tank and portable gas kitchen burners. They set up their kitchen in a classroom, the same classroom where our girls sleep. All weekend long, the cooks are busy preparing and cooking fresh acorn squash, paleche (white maize meal), stewed beef and gravy. The athletes love the rich food: there are never leftovers. In 2013, our school’s girls team made it to the zonals for the first time ever. This year, the girls did not make it to zonals, but the boys did, after a tournament drought of many years. Once there, things did not go so well. We had a strong pitching staff (two players), and they could get the ball into the strike zone most of the time (and this is fast pitch). Our first baseman snagged almost every ball coming his way and made more than his share of outs. The rest of our squad consisted of good hitters, but less than ideal fielders. Remember that these boys never played Little League. They likely never experienced softball before they got to 8th grade. Our short stop and third base players moving infield to get ready for the next play at a tournament. The bottom line: our boys team did not advance beyond the zonals. As they say, there’s always next year. We have some good returning players, and there are good coaches. Unfortunately I won’t be around then. When this is all over, as odd as it sounds, coaching softball at my school may be one of the things I will miss most about my Peace Corps experience. The Boys of Winter (with me). South Zonal Tournament, Lobatse. A special thanks to friends from Manchester who responded to my call to send softball gloves. Because of them, we had enough gloves for the boys and girls starting lineups this year. Copyright Tom Donovan. Manch-Tswana is our own creation. Peace Corps is not responsible for content. Picture Window theme. Theme images by mskowronek. Powered by Blogger.